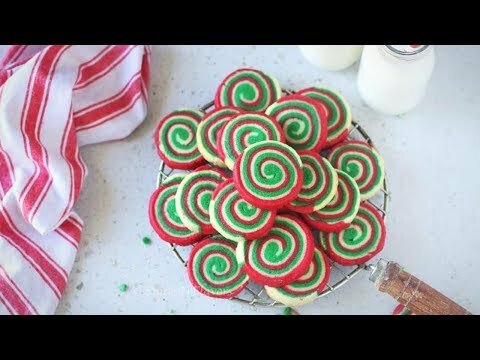 In this video let us see how to make Eggless Christmas Pinwheel Cookies | Eggless Swirl Cookies in a step by step format. Make your holiday baking fun with these tasty old-fashioned Eggless Christmas Pinwheel Cookies!! Ditch all the chocolate, raspberry and salted caramel cookies and try this classic combination of vanilla and peppermint red and green eggless swirl cookies for kids with this easy to follow simple shortbread cookie recipe video. These Christmas Swirl Cookies are so festive that it is your gateway to make your holiday baking fun and to add colour to your cookie box!!! Using the paddle attachment of your stand mixer, beat together butter and sugar until combined. Meanwhile mix together salt and flour. Keep aside. Once butter and sugar are combined, add a tbsp of water and combine. Then add the flour mixture in 3 batches. That adds 1/3 of the flour mixture, mix until you see no dry bits of flour. Scrape the bowl down and add other 1/3 of flour mixture. Repeat the process until all the flour is mixed in. Finally, add in the remaining water and vanilla essence. Mix until everything comes together to a dough. Do not over-knead the batter. Take the dough out onto your workstation and divide into three equal portions.